An important part of travel to New Orleans is the food. New Orleans has some of the best food in the entire United States. New Orleans has stayed true to its roots with some of the oldest restaurants in the country and restaurants serving traditional New Orleans food. However, New Orleans has also remained relevant with new restaurants serving modern cuisine which complement the classic restaurants of New Orleans. 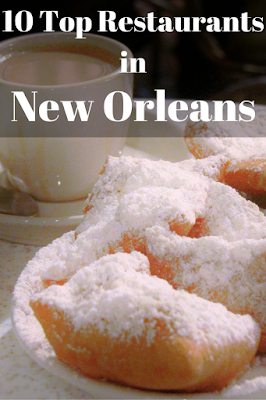 During our one week visit to New Orleans, we dined at these top restaurants in New Orleans. Antoine’s Restaurant is one of New Orleans’ restaurants in the French Quarter. Antoine’s is the oldest family-run restaurant in the United States and has been serving French-Creole dishes to residents and travelers since 1840. Antoine’s has served New Orleans cuisine through the Civil War, World War I, World War II, and the Great Depression. Antoine Alciatore emigrated from Marseilles, France. He had apprenticed since the age of eight under the French chef Collinet at the Hotel de Noailles in Marseilles. At the age of 18, Antoine adopted New Orleans as his home and opened a restaurant in 1840. Antoine brought haute cuisine to New Orleans. He was the first to serve Chicken Creole, Crayfish Etouffee, and Shrimp Remoulade and invented dishes like Crayfish Cardinal and Shrimp Mariniere. Antoine’s son Jules, who took over the restaurant, invented a number of oyster dishes including the most famous Oysters Rockefeller. To experience this classic and famous New Orleans restaurant on a budget, come in for a three martini lunch. For $20.16, you can enjoy a three-course meal and $0.25 martinis. While Antoine’s is famous for their Oysters Rockefeller, I actually preferred the charbroiled oysters that came with the lunch special. Arnaud’s is another of New Orleans’ French Quarter restaurants that is a classic. Arnaud’s has been serving classic Creole cuisine since 1918. If you’re looking for a fancy or romantic night out, Arnaud’s is the place to go. Arnaud’s has perfected the art of elegant dining with stellar cuisine. Arnaud Cazenave’s Philosophy of Dining states in part, “Americans are prone to forget, in the ultra-rapidity and super-activity of modern life, trying to crowd eighty seconds of toil into one minute’s time, that eating should be a pleasure, not a task to get over with in a hurry. A dinner chosen according to one’s needs, tastes and moods, well prepared and well served, is a joy to all senses and an impelling incentive to sound sleep, good health and long life. Therefore, at least once a day, preferably in the cool and quiet of the evening, one should throw all care to the winds, relax completely and dine leisurely and well.” Amen. Our dinner at Antoine’s was one mouth-watering course after another. We started with Oysters Bienville, an Arnaud’s original made with shrimp, mushrooms, green onions, herbs, and seasonings in a white wine sauce. We also had Shrimp Arnaud, a signature dish of cold gulf shrimp marinated in tangy Creole Remoulade Sauce with horseradish. For a sample of Arnaud’s specialties, order Veal Wohl, a three-in-one extravaganza. Veal Chantal is tender tournedos of veal sautéed and served in a wild mushroom sauce. Arnaud’s crab cake is made with jumbo lump Louisiana crabmeat served with a white remoulade sauce. The Crawfish O’Connor is baked in a brandy-infused classic Creole tomato based sauce. Commander’s Palace is another classic and famous New Orleans restaurant, but this one is in the Garden District. Commander’s Palace was named the best New Orleans restaurant of 2015 by Gambit New Orleans. Commander’s Palace was first opened by Emile Commander in 1893 (not 1880 as had been previously believed) and is now managed by the Brennan family. Famous chefs like Emeril Lagasse have worked in the kitchen of Commander’s Palace. Commander’s Palace concocts inventive cocktails like the Big Daddy, made with apple pie flavored moonshine with a sprinkle of cinnamon on top. For dinner we had the cast iron seared gulf fish with chanterelle, yellow foot, and black trumpet mushrooms, all flambéed with Cognac, grilled Tuscan kale, roasted tomatoes, and sweet onion soubise and compressed basil. Be sure to end dinner with Commander’s Palace’s famous Creole bread pudding soufflé. There are certain dishes you must have while in New Orleans, and gumbo is one of them. The Gumbo Shop is a tiny restaurant in the middle of the French Quarter that serves some of the best gumbo in the city. (There will obviously be some who argue the best gumbo is served elsewhere in the city, but we chose the Gumbo Shop on the high recommendation of a local.) Don’t be intimidated by the long line coming out the door. As a couple, we were actually seated pretty quickly. We sat out in the cute little interior courtyard and ate the locals’ favorite, chicken Andouille gumbo, as well as crawfish etouffee, all washed down with a local beer. Possibly my most favorite meal in New Orleans was also a simple one. Parkway Bakery & Tavern’s fried oyster po’boy, only served on Monday’s and Wednesday’s, is a thing of beauty. It’s a commitment to travel to Parkway Bakery & Tavern, as it is 15 stops away from the French Quarter via the green or red line streetcar, but it is worth both the trip and the long wait in line. The fried oysters are succulent, the freshly baked bread is perfection, and the meal goes over the top with cheese smothered fries and a bottled root beer. Cochon, located in the Warehouse District, is one of New Orleans’ newer restaurants, if you’re comparing to those that have been around for almost 100 years or more. Cochon is French for pig and is a favorite ingredient of chefs Donald Link and Stephen Stryjewski. Cochon is such a popular New Orleans restaurant, the owners were able to open its more casual neighbor Cochon Butcher. Cochon Butcher is a butcher shop, sandwich counter, and wine bar. You get in line, order at the counter, take a number to your table, and wait for your food to be delivered. We went to Cochon Butcher for their muffaletta. The muffaletta has been in New Orleans for a long time, as it came to New Orleans with Italian immigrants, but as a butcher shop that makes their own meats and pickled vegetables, Cochon Butcher’s muffaletta is one of the best in the city. La Petite Grocery is located in a century-old building in the Garden District. It has been named one of the best restaurants in New Orleans multiple times and celebrated its 10 year anniversary in 2014. La Petite Grocery’s Chef Justin Devillier, a fellow Californian, joined the team when the restaurant opened, was promoted to Executive Chef in 2007, and then bought the restaurant, along with his wife Mia, in 2010. Chef Devillier puts his spin on New Orleans classics like the Turtle Bolognese and Blue Crab Beignets. Both of these dishes are must orders. The Turtle Bolognese is spicy, the turtle has a texture similar to ground beef, and it is served with flat noodles and a deep fried egg. I’ll take a Blue Crab Beignet over a dessert beignet any day. Don’t bother with the sauce, just add a little squeeze of lemon and enjoy the creamy crab inside the light, pillowy beignet. Another contemporary restaurant in New Orleans is Coquette, located in the Garden District and open since 2008. Coquette serves southern cuisine made with locally sourced products. We dined at Coquette on New Year’s Eve, so only a prix fix menu was offered at the time. However, Coquette’s menu includes modern dishes with southern flair such as tempura gulf shrimp, red snapper ceviche, and smoked duck confit with okra. Coquette also features an international wine list and inventive New Orleans cocktails. The Bombay Club was a French Quarter favorite, but in 2013 the owner died, the restaurant closed, and management was transferred to Creole Cuisine Restaurant Concepts. The restaurant went through a renovation and reopened in December 2014, just over a week before we dined there. The Bombay Club & Martini Bar oozes old school charm. The vibe is rustic casual with dark wood, curtains, and leather seats. If you can, ask for a booth. The restaurant features a British menu with a Cajun twist with menu items like Scotch eggs with boudin and braised collard greens (the yolk of the Scotch egg is replaced by the boudin sauce which is made with the yolk). Of course, the bar makes a wide selection of martinis, served in old-style champagne glasses, which are accompanied by live music nightly. I don’t really know that Café du Monde qualifies as a restaurant per se, but I feel like a list of places to eat in New Orleans would be incomplete without mentioning Café du Monde. Café du Monde is New Orleans’ original French Market coffee stand which has been serving powdered sugared cloud-like beignets and chicory coffee since 1862. You can get your beignet fix any time of day as Café du Monde is open 24 hours a day, seven days a week, except for Christmas Day. New Orleans is filled with top, classic, and famous restaurants, and we didn’t get to visit them all. On our New Orleans restaurant wish list for our next trip are Mr. B’s, Galatoire’s, Drago’s, Peche, and so many more. But this list of 10 of the top restaurant’s in New Orleans will provide you with a great mix of New Orleans restaurants to get you started on your tour of the city through food. Thank you to the New Orleans Convention and Visitors Bureau and the New Orleans Hotel Collection for hosting our trip to New Orleans and making this post possible. As always, all opinions are my own. For updates on what is going on in New Orleans, follow the New Orleans CVB on Facebook, Twitter, and Instagram.